An unhappy man (Alan Curtis) attends a musical show with a mysterious woman (Fay Helm) he meets at a bar, then returns home to find his wife strangled to death and a bevy of policemen (Thomas Gomez, Regis Toomey, and Joseph Crehan) eager to question him. 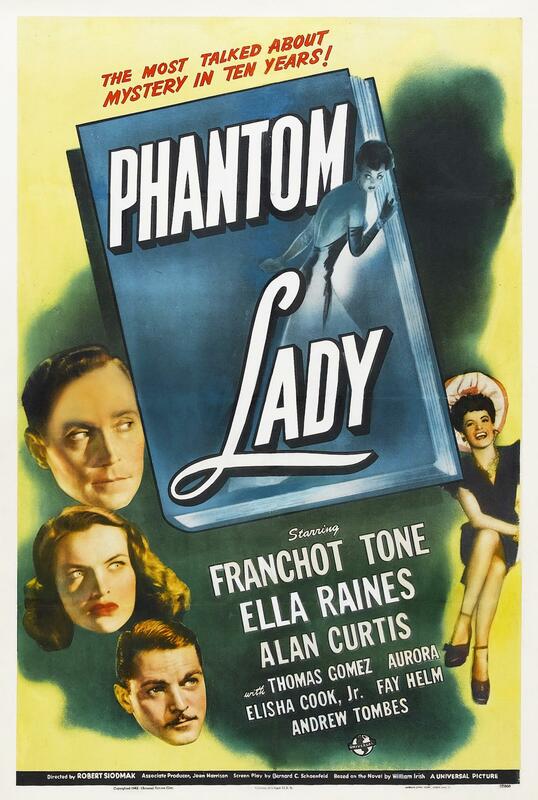 When Curtis is sentenced to death because he can’t verify his alibi, his beautiful secretary (Ella Raines) does everything she can to help find the “phantom lady” Curtis spent the evening with — but her efforts are foiled at every turn. 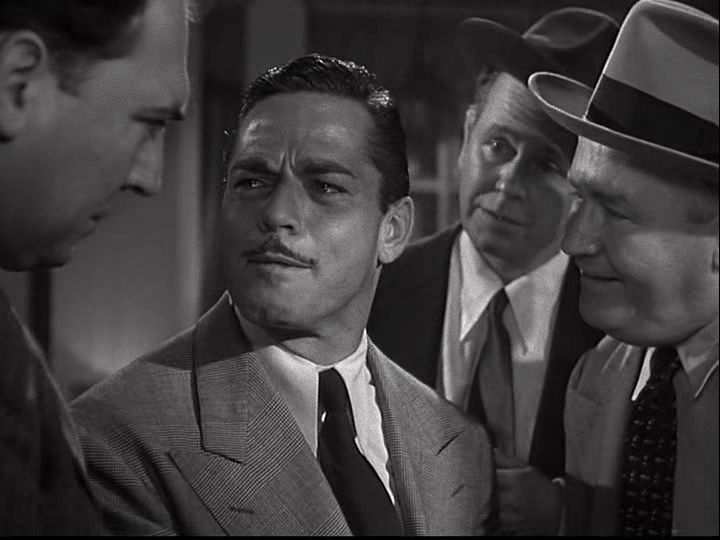 Could Curtis’s best friend (Franchot Tone) have anything to do with the case? Robert Siodmak directed this engaging, atmospheric, but narratively flawed noir about a plucky amateur sleuth (Raines) determined to save the man she not-so-secretly loves. 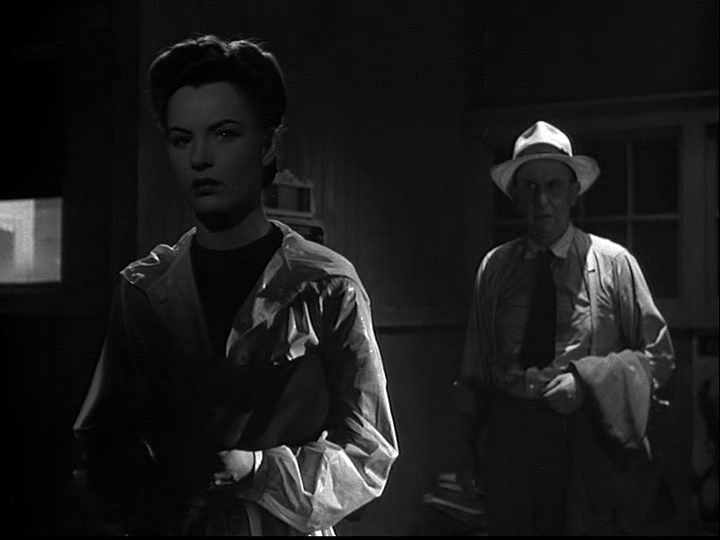 From the opening shot showing the back of an outlandish hat (belonging to the inexplicably gloomy “phantom lady”), Siodmak keeps us guessing about who each of the primary characters are, what role they may eventually play in the mystery (or not), and who’s ultimately behind the murder of a character only seen post-mortem in a glamorous portrait a la Laura (1944) (released later that same year). We are eventually let down by the unsubtle inclusion of a character whose deluded state of mind is far too transparent, and whose performance edges into campy territory. 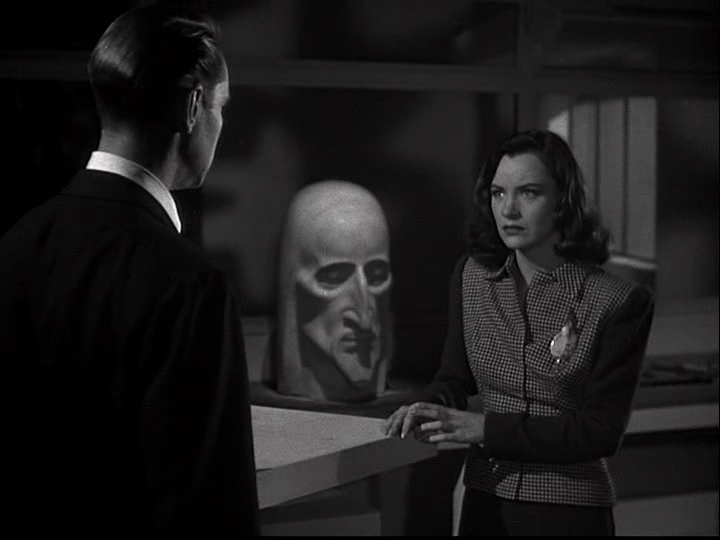 However, expressionistic cinematography and memorable sets make the film a consistent visual treat, and the central mystery — who IS that phantom lady, and why was she so determined to keep her identity a secret? — builds to a nice reveal. 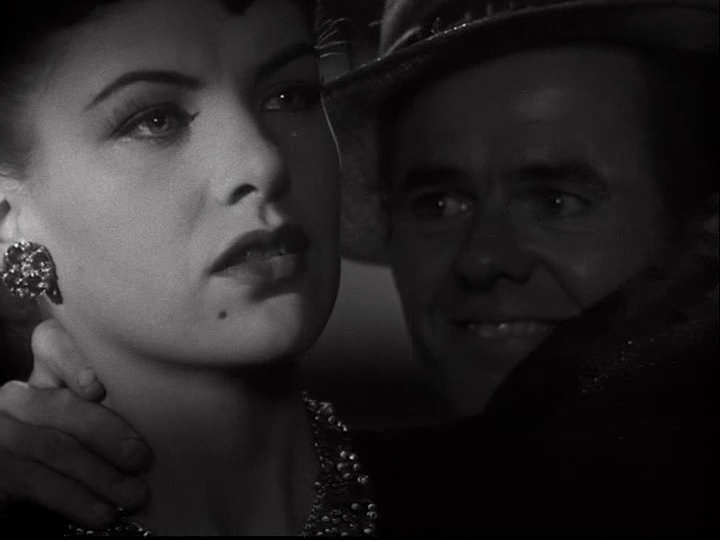 Watch for a truly deranged Elisha Cook, Jr. playing a cartoonishly lustful drummer, and Carmen Miranda’s sister Aurora as a performer literally seething at the idea of another woman wearing one of her designer hats. 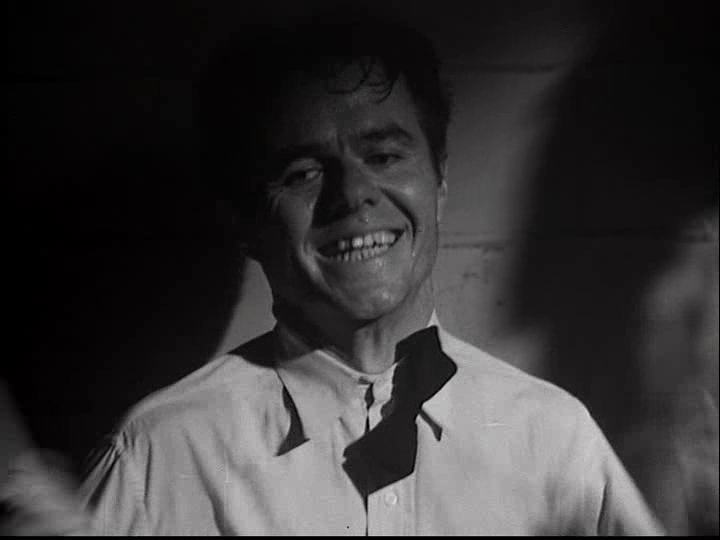 Note: Leading man Alan Curtis plays a radically different — and much more sympathetic — character here than in High Sierra (1941), where he was cast as Lupino’s abusive boyfriend ‘Babe’; he’s also known for his leading role as a paratrooper in Douglas Sirk’s Hitler’s Madman (1943). 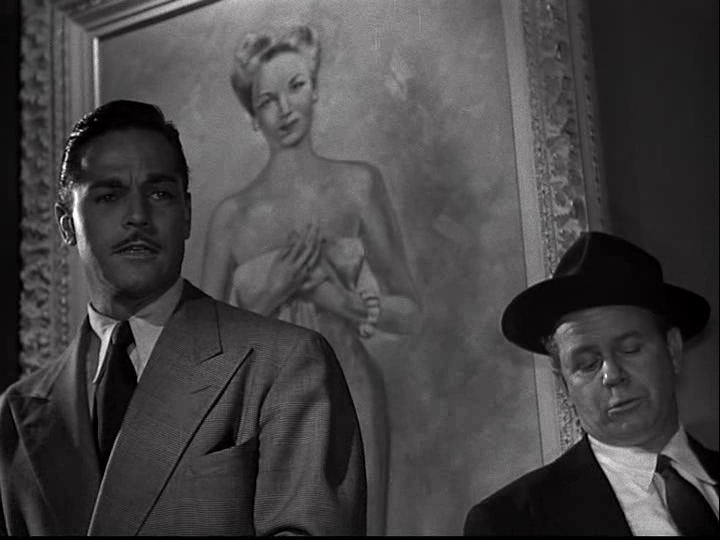 Yes, as a distinctive if flawed noir classic. Listed as a Cult Movie and a Personal Recommendation in the back of Peary’s book. Must-see. This is one of the great films from Siodmak’s very productive period in the mid-’40s and, as such, doesn’t disappoint. I take a much different view here – and I don’t find the film flawed at all. It’s based on a Cornell Woolrich novel (and I’m starting to think I should be much better acquainted with Woolrich’s work…other than the film adaptations that came from it). The story is a brain-teaser – and it succeeds only as far as you allow yourself to go with it. Picking apart the mechanics of the set-up would, I think, be counter-productive. I had seen this only once before – it’s not a widely available flick, I don’t think – but, seeing it again, I just gave over to it..and I find it quite gripping. In lesser hands than Siodmak’s, of course, this might have been much less of a film. But it seems Siodmak looked over the material carefully and figured out all of the perfect opportunities for adding what he has added so well to the best of his work. 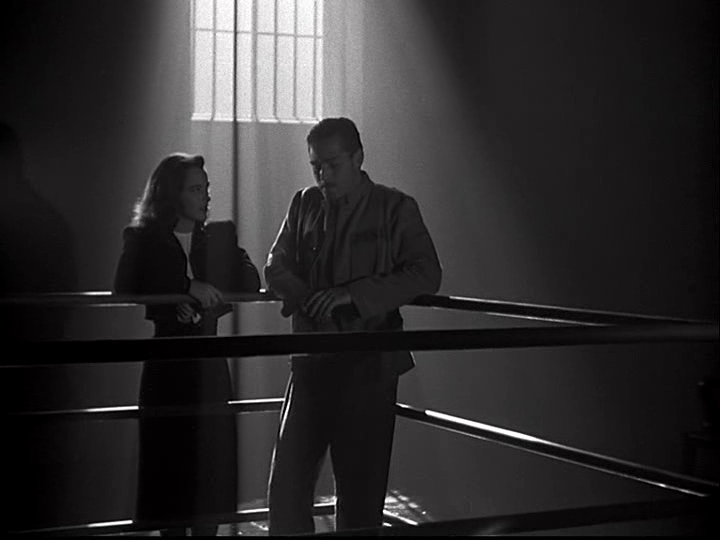 There is one sequence in particular in which Siodmak shines. To help Curtis out while he is behind bars, Raines does some investigating on her own. In this process, she follows a suspicious bartender home after he leaves work. This takes them – and us – over a fair stretch of New York City. It’s all very noir and very tense. It’s a remarkable sequence. 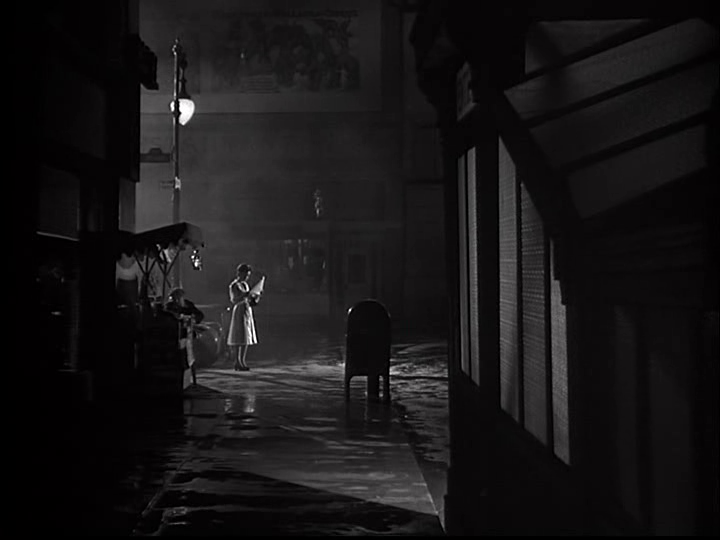 …And one of many highlights Siodmak affords us. Obviously, I was pretty caught up in this movie. Lovers of this kind of thriller should, I think, find it quite memorable. And it would probably hold up well under a few repeat viewings.